Beautiful cabin overlooking Henry's Lake off US 87 in Island Park Idaho. Cabin is 15 min away from West Yellowstone by car and is located 3.5 miles from the US 87/US 20 junction. Easy access to Yellowstone National Park. Excellent fishing, boating and water activities as well as hiking etc. Views of Henry's lake and mountains are beautiful from deck/cabin. The cabin is across US 87 from Henry's lake. There is public access to the lake down the road from the cabin and boat rentals available. Mountain behind cabin fairly wild with elk, deer, bears being seen intermittently. We are renting the first floor of our three level house. The Bedroom in the apartment has a queen bed and there is a air hide a bed as well on that level in the living room. We sleep 4 in the apartment. There is a microwave and coffee pot , also a refrigerator in the apartment itself and a dining table and chairs. We have dishes silverware paper plates, anything you need. The living room has a stone fireplace which is wood burning. There is a wrap around deck with covered patio and barbecue which is accessible to guests. Washer and dryer available. HDTV with Direct TV service. Ample parking for boats and toys. Come stay with us and enjoy the views and Yellowstone Park. WIFI is available for our guests. Grand Tetons can be seen in the distance on a clear day and the Henry's Lake and Centennial Mountains offer spectacular scenery. Both paper and stone ware. Music stations on direct T.V. Direct T. V. All your favorite stations. Board games, dominoes, card games, many others. Two patio tables, large deck available for your outdoor eating area. We lived being in the apartment, it is very clean and comfortable. The only draw back is that there is no sink or stove in the apartment. We were able to prepare a few dishes in the kitchen of the owners, whick was really nice. Kathy and Harry were great hosts! Loved having you. We never said we had a stove in the apartment, but we were glad to share our kitchen with you. You were wonderful guests. Our hostesses made us feel welcomed. Provided us with info about the park, even bear spray. The House was exactly like described in the listing. Beautiful views of lake. Very friendly and delightful. Would enjoy having them again. Great home and wonderful hosts. Location near Henry's lake was ideal! We really enjoyed our stay at this wonderful home. The hosts were wonderful, friendly and very helpful with information about the area. 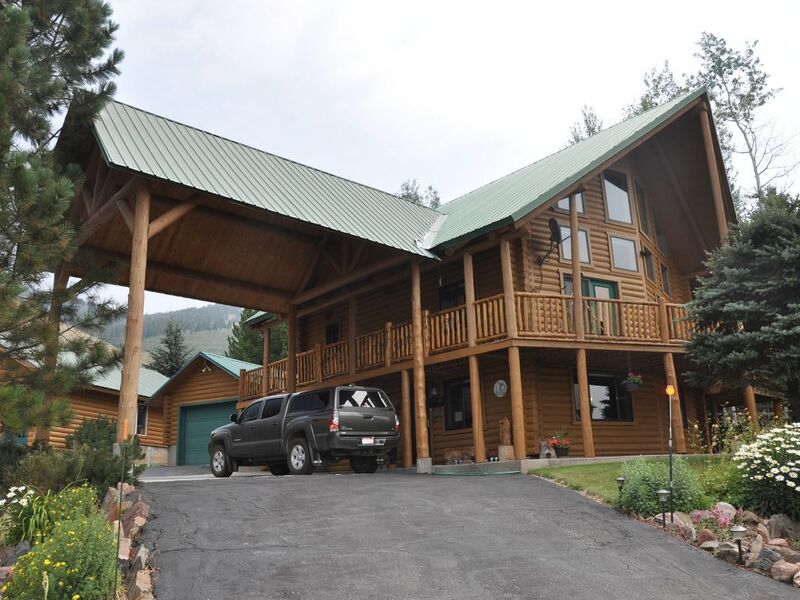 This is a good location overlooking Henry's Lake and about 20 minutes from Yellowstone National Park. We highly recommend this outstanding home. Harry was extremely nice, courteous, respectful, attentive and the house is beautiful and well located. We would advise Harry to build a wall between the guest and host floors so that host and renters do not hear each other. We also think he should put in his ad that he will regularly go through the renters' rooms for dirty dishes and to do laundry. We didn’t mind but we’ve never experienced hosts regularly passing through our space with VRBO rentals before so we were initially surprised. We totally enjoyed our stay. We felt so at home the moment we arrived. The home is beautiful and well maintained. We had the best sleep ever. It was easy to find and only a short drive to Yellowstone Park. Beautiful scenic view of Lake Henry each morning. We would totally recommend choosing this home. We had many wonderful conversations with the owner. We feel like we have a new friend for life. We loved having you and my husband wants to thank you for your understanding my absence at the time. Would love to have you again. We stayed at Kathy's and Harry's during our two day trip to Yellowstone National Park. Kathy was out of town for some emergency reasons, but her husband, Harry was there to greet us and show us around. Their cabin is beautiful with great views of Henry's lake. The house was very clean and had all the necessary amenities. A big thanks to Kathy and Harry for allowing us to stay at their cabin. Definitely coming back again. Thank you for choosing our cabin for your stay . My husband tried to make your stay comfortable and enjoyable. We place our guests above all else.